land art generator initiative's aim is to accelerate the transition to post-carbon economies by providing models of renewable energy infrastructure that add value to public space, inspire, and educate—while providing equitable power to thousands of homes around the world. 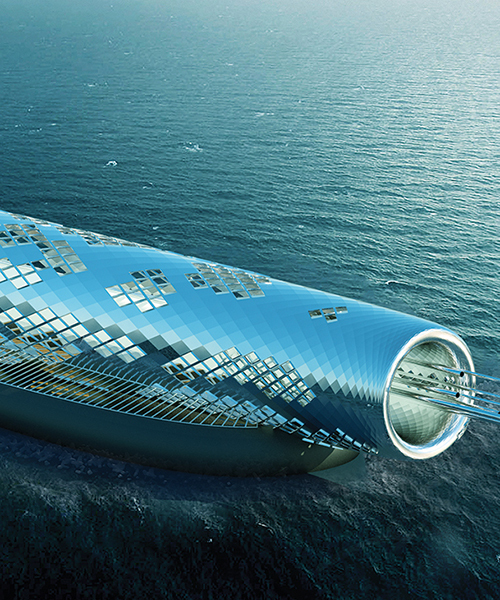 this massive solar powered pipe proposed for the 2016 land art generator initiative by khalili engineers intends to desalinate seawater into drinkable fluid. 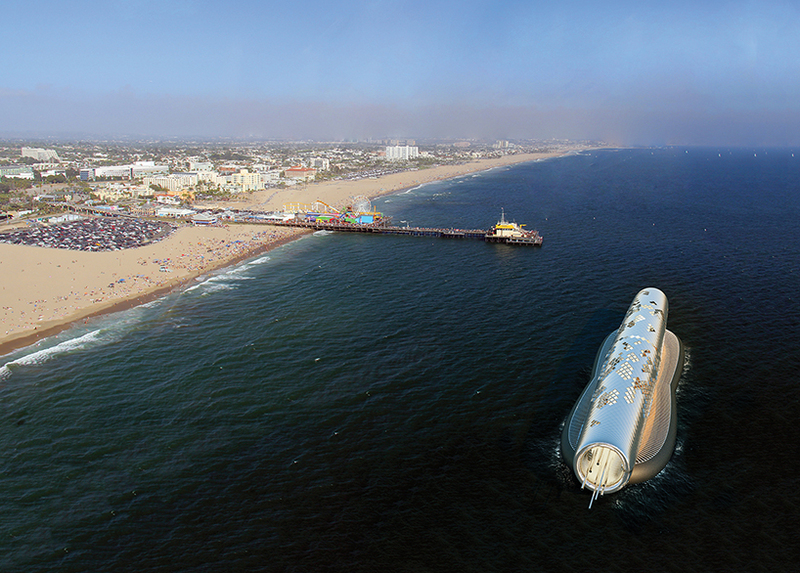 the concept — a blend of artistic, technological and architectural properties — floats off the coast of santa monica, california ‘reminding us about our dependence on water and about our need to appreciate and value this vital gift,’ the engineers describe. 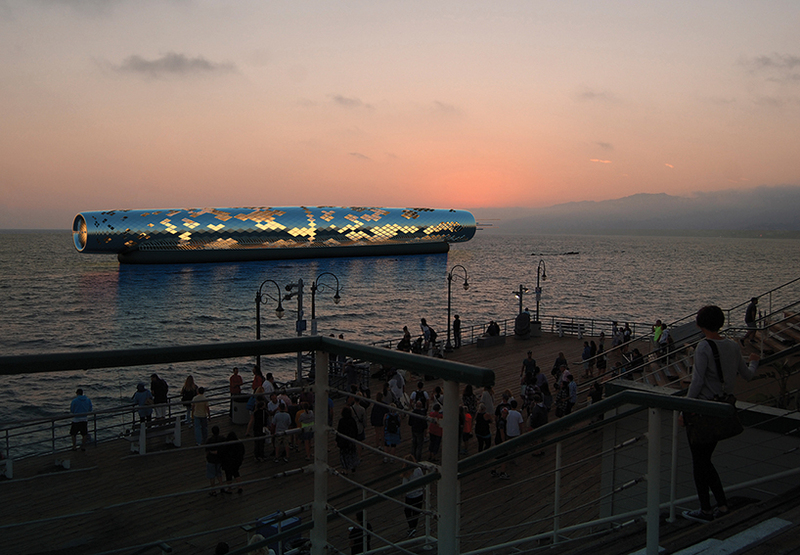 khalili engineers’ ‘pipe’ is not only an architectural and technological system, but also acts as a place for visitors to relax and observe panoramic ocean views. 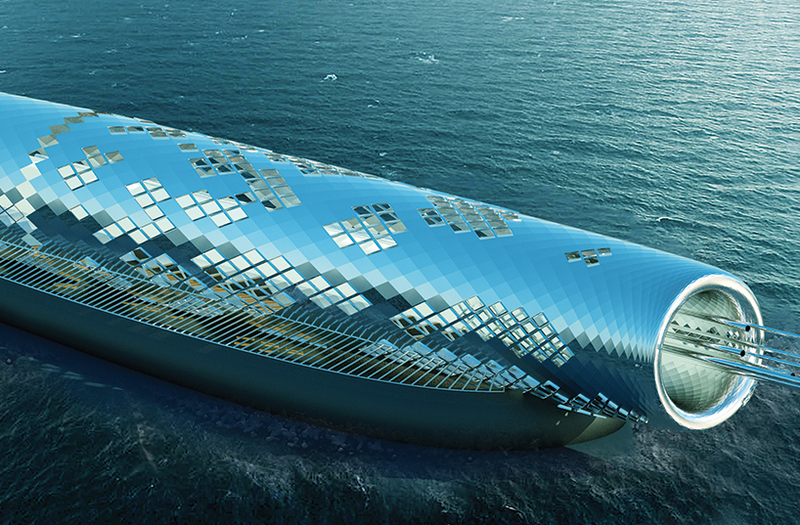 its solar panels provide power to pump seawater through an electromagnetic filtration process, simultaneously distributing fluid to a salt bath with natural healing properties, and generating 4.5 billion liters of drinking water for the city using an electromagnetic desalination process. ‘electromagnetic filtration uses an isolated electromagnetic field on pipes circulating seawater, separating the salts and impurities. the process is rapid and energy efficient,’ the engineers elaborate. the results of ‘the pipe’ intend to provide both drinkable water to the city’s primary piping grid, and clear water with twelve percent salinity to be used for thermal baths. while the drinking water is piped to shore, the salt water supplies the baths before it is redirected back into the ocean through a ‘smart release system’. 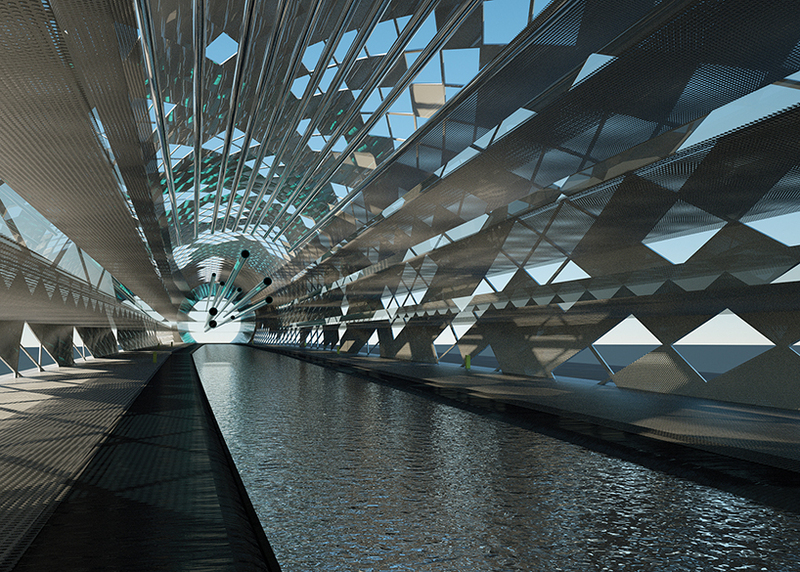 the proposal has been submitted for the 2016 land art generator initiative — a platform whose international design competition provides an opportunity for creatives to reflect on the nature of energy infrastructures and what they can aspire to be in their built form. this edition’s competition winners will be announced in october 2016.